In this its sixth year, the 2018 Doula UK conference will focus on how doulas and other birth and postnatal workers can support women who have experienced trauma or abuse. Keynote speaker, Kicki Hansard, drawing on the training she has completed with Penny Simkin, will talk about nine challenges in childbirth faced by survivors, and the possible solutions to these challenges that birth workers can explore with their clients. Bridget Supple will help us understand the long term affect of trauma on the brain, and Mr Raja Gangopadhyay and Dr Diane Speier will explore holistic strategies for protecting perinatal mental health. We will also hear from Maddie McMahon on providing good infant feeding support, and Hilary Lewin and Joy Horner will present their survival toolkit for doulas. Two years on from the release of the publication of the National Maternity Review report, Jo Dagustun, a social geographer, will lead a workshop around implementing Better Births at a local level. Mari Greenfield’s workshop will address the choices women have after traumatic birth, and Birthrights’ CEO Rebecca Schiller will share crucial insights and facts surrounding human rights in childbirth. Midwife Mark Harris will look at a partner’s role during pregnancy, birth and beyond, and author Riga Forbes will offer delegates an opportunity to develop mindfulness for self care in their practice. We will be joined by The Calm Birth School founder and mentor Suzy Ashworth, who will address the challenges associated with turning a passion (such as doulaing) into a successful business. In addition to this busy schedule of talks and workshops, delegates will find a bustling exhibition area with an interesting variety of organisations and businesses represented, including our Sponsors Morton Michel and Weleda, plus BirthBliss, Pregnancy to Birth, Beaded Birthlines, Crystal Forest, Pinter and Martin, Sling School, Way of the Koi, Nom Nom skincare, Placenta Remedies Network, AIMS and the ABM. Delegates will also be treated to a performance of ‘WILD’ (a Birth Project production), and poetry from Dzifa Benson. 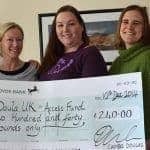 Our popular Access Fund raffle is of particular importance this year, as Doula UK begins the process of converting the project to a charity. The conference takes place on Saturday 24th March 2018 at etc.venues St Paul’s, 200 Aldersgate, EC1A 4HD. Tickets are allocated on a first come first served basis, and are available to buy via the Doula UK website. Founded in 2001, Doula UK CIC is the membership association of around 700 birth and postnatal doulas in the UK, ROI and Channel Islands.